The African-American tradition of philanthropy is long-standing, aided by the Christian custom of tithing — giving 10 percent of earnings to the church. Even outside the church, astonishing acts of charity have been made by people of humble means, such as washerwoman Osceola McCarty's $150,000 gift to the University of Southern Mississippi upon her death in 1999. The tradition of giving is being continued by the most fortunate among African Americans, particularly toward education. 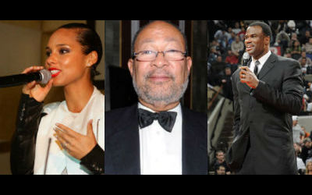 Meet 12 top philanthropists within the black community. As the founder of Baltimore-based Brown Capital Management, Brown leads one of the country's oldest African-American-owned investment-management firms. Brown and his wife established the Eddie C. and C. Sylvia Brown Family Foundation at the Baltimore Community Foundation in 1994. In 2002, the couple donated $5 million to the Baltimore Public School system, starting the Turning the Corner Achievement Program, an initiative preparing African-American middle-school students in Baltimore for high school and beyond. The Cosbys have a long history of philanthropy and a strong commitment to education. In 1988, they donated $20 million to Spelman College, the largest gift ever given to a black institution. The couple also donated $1.3 million to Fisk University. In 1997, they established the Hello Friend/Ennis William Cosby Foundation to fulfill their late son's dream of helping those with learning difficulties. Alphonse "Buddy" Fletcher Jr. is the chairman and chief executive officer of Fletcher Asset Management in downtown Manhattan. On the 50th anniversary of the Brown v. Board of Education ruling in 2004, Fletcher and his partners launched a $50 million initiative supporting people working toward the ruling's goal of creating opportunities for all. Created in 1993, the Fletcher Foundation also funds a program that provides $50,000 fellowships, as well as a professorship endowment at Harvard University held by The Root's editor-in-chief, Henry Louis Gates Jr.
After getting to know the West Side of Chicago through her work with the Boys and Girls Clubs, Jordan, mother of basketball great Michael Jordan, wanted to make sure all children had a fair chance at educational success. She established the James R. Jordan Foundation, named after her deceased husband, encouraging parents to be active participants in their kids' education. Most recently, Jordan established the James R. Jordan Foundation International and founded the Kenya Women's and Children's Wellness Centre as its inaugural project. Fourteen-time Grammy-award winner Keys has donated her time and funds to many charitable causes. She co-founded Keep a Child Alive with AIDS activist and film-television producer Leigh Blake in 2003. The organization is committed to providing life-saving AIDS medicine and care to children and families in India and Africa. Additionally, the organization lends support to AIDS orphans. The organization raises money annually through the Black Ball, and in 2010, Keys' Digital Death campaign raised over $1 million for Keep a Child Alive through Twitter and Facebook donations, according to MTV.com. Former leader of Island Def Jam Music Group and Warner Music Group Liles leveraged his music industry prowess to enter into philanthropy. He founded the Make It Happen Foundation, which provides life-changing opportunities for under-serviced youth, and the Kevin Liles for a Better Baltimore Foundation, exposing Baltimore youth to social, educational, economic, cultural and civic opportunities. In 2002, Liles donated $150,000 to help complete the construction of the Woodlawn, Md., High School athletic stadium, the high school he graduated from in 1986. As the former chairman of Citigroup and Time Warner, Parsons has given substantially to education. In 1993, Parsons donated $1.4 million to establish the Parsons' Scholarship fund at Howard University. Today, he sits on the board of the Rockefeller Foundation, which was founded in 1913 to help find solutions for the world's biggest problems. Two-time Olympic Gold medalist David "The Admiral" Robinson, formerly of the San Antonio Spurs, gave his best on and off the court. A former Navy midshipman, Robinson is highly regarded as one of the top centers of his era, NBA.com says. Robinson pledged $9 million to build and operate the Carver Academy. Named after pioneer George Washington Carver, the independent San Antonio middle school has served multicultural students since opening its doors in 2001. Dubbed the "Godfather of Hip-Hop Philanthropy," Def Jam co-founder Simmons has raised millions of dollars to benefit urban youth through his Rush Philanthropic Arts Foundation and Hip Hop Summit Action Network. In 2011, Simmons' annual Art for Life benefit raised $1.7 million to give disadvantaged youth access to the arts. Simmons also supports PETA and the Doe Fund. Snowden is currently the CEO of Boston-based Freedom House. Founded by her parents Otto and Muriel Snowden in 1949, the organization funds programs across the country involved in civil rights, education and public policy. With its community partners, the organization funds several community, educational and technology-based programs preparing inner-city students for success in high school and beyond. Famed television mogul Winfrey has donated more than $300 million by some estimates, collectively through the Oprah Winfrey Foundation, Oprah's Angel Network and the Oprah Winfrey Leadership Academy Foundation. Forty million dollars alone went toward the creation of Winfrey's leadership academy for girls in South Africa. One hundred percent of proceeds from Winfrey's Angel network funds charitable projects and grants globally.